User researchers work across the Home Office, gaining insight to improve services in immigration, passports and borders. None of this could happen without user research participants and somewhere to talk to and observe them. Labs can be expensive – a typical London lab costs up to £1,500 a day. Which is why the Research Services team has created research labs in Croydon and Sheffield. Every time you hold research in our labs, we’re making significant savings. Email researchservices@digital.homeoffice.gov.uk to find out about availability in the labs and to book. Whether you’ve found your own participants, or worked with us to find some, we can help you book them into sessions and support you on the day. Both labs have a seating area for introductory conversations and interviews, a desk set up with laptops for testing prototypes, and cameras and microphones for recording the session. 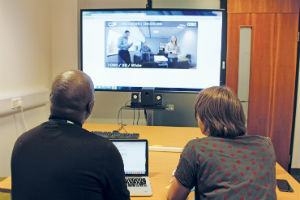 The usability testing and observation rooms in Croydon. We also have document cameras and will be adding spider phones. Get in touch if you think you’ll need anything else in your session. We’ll be on hand during your session to make things run smoothly and to help with any technical issues. One of the benefits of lab based research is that the whole team can be involved. 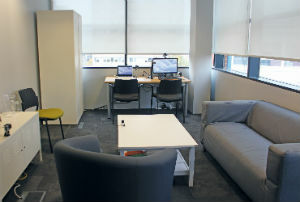 The observation room in Croydon can seat 4 people, while those using the Sheffield lab can watch the session from any meeting room (tip: S.109 has a sofa). At the end of the day we’ll give you video files of your session. Files are large, so allocate time at the end of the day to download them. Labs are great, but without participants there’s no user research. Research Services can help here, too. We’re creating a participant recruitment service and will take this opportunity to explain how it works. The first thing to say is that recruiting user research participants takes time, so get in touch early if you think you might want our help. We suggest that researchers start with an initial consultation with our team. This lets us learn about the kinds of participants you need and offer recommendations for finding them. Depending on your research, we might also suggest places where you can find suitable participants yourself. It also lets us review any ethical considerations and make sure we get informed consent. We might email participants who have agreed to be contacted, so we’re directly recruiting participants at no cost to the project. We’re also building contacts with external organisations, charities and consumer groups, so people in these sectors can take part in our research. By making recruitment easier for participants who already use our services or have a relationship with us, we can save the Home Office at least £70 per participant. Email Research Services at researchservices@digital.homeoffice.gov.uk.